we can rebuild just about any pump. yes, even the ones without the manufacturing tags. As long as we have been in business, we have been rebuilding pumps. Multi-stage, split case, horizontal, centrifugal, reciprocating, etc. Because we work for a very broad and diverse customer base, we have seen a very broad and diverse set of pumps. What we’re most proud of, is how we’ve helped customers solve problems and create custom solutions. For example, if you have a pump that the wear rings are not holding up in, we have a series of questions to ask about your product you’re pumping. We can then make a suggestion on material and make your next set of wear rings in house. Over the years, we’ve been tasked with upgrading and modifying many different types of pumps based on the application that they were running. 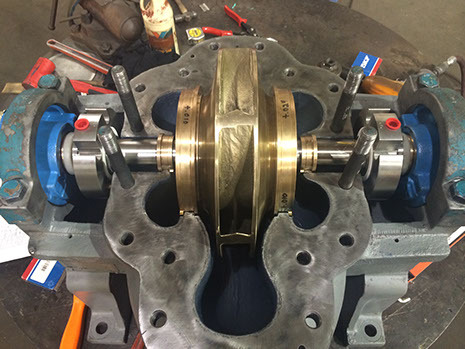 We offer a variety of services when it comes to industrial pump repair. There are a number of services when it comes to industrial pump repair that are offered by us. Some of these services include seal upgrades, dynamically balancing impellers, pressure testing, sandblasting, and wear coatings. Other services we can perform include dynamic balancing, Inpro seal modifications, and proprietary materials for certain customers. The turnaround time that you could be looking at if you are needing your pump repaired can vary anywhere from a few hours to a few days or to even a week. The time all depends on what you are needing repaired on your pump and how the pump is configured. We also maintain an inventory with an adequate supply of bearings and seals that are common in a lot of the pumps that you may have. This type of inventory helps to cut down on the time and cost of your pump repair. It also makes the repair process for us a much more effective and efficient process. One of the main distinguishing characteristics of our company is that we are our own machine shop. When it comes to building new shafts, wear rings, dynamically balancing the impellers, etc., it is all done in house. Not only are we able to service all of the major brands of pumps, but we also service obsolete pumps. Have a pump with no manufacturer’s tag? No problem. Chances are we’ve rebuilt one like it before. We also offer a pick-up and delivery if you can’t physically get the pump to us yourself. We understand that you may not have the time or the personnel to take your pumps to the repair shop yourself, so we are happy to do this for you.